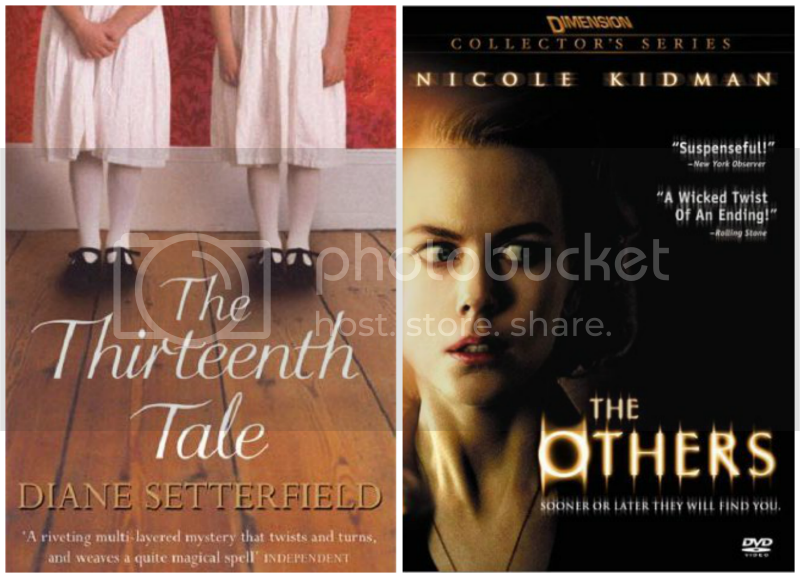 If there’s anything I love as much as books, it’s movies, so instead of doing either/or for my list this week I decided to match books with Halloween movies to create the perfect atmospheric pair. Some were because of subject matter, some simply because of the feel of the story. All imbued with Halloween spirit! I’ve read The Thirteenth Tale only once and seen The Others only once but it each case, the story has haunted me ever since. They are both Gothic ghost stories about creepy houses and dark family secrets with unreliable narrators and enough twists to make you gasp. They find a way to get underneath your skin and make it crawl. Brilliantly told but not for the faint of heart! On the surface they might not seem to have much in common but the ruined mansion on the edge of a Maine sea cliff coupled with supernatural secrets and a melancholy air lurking beneath the surface made me realize that Between the Devil and the Deep Blue Sea would be perfect for older readers that had been fans of Casper as kids. 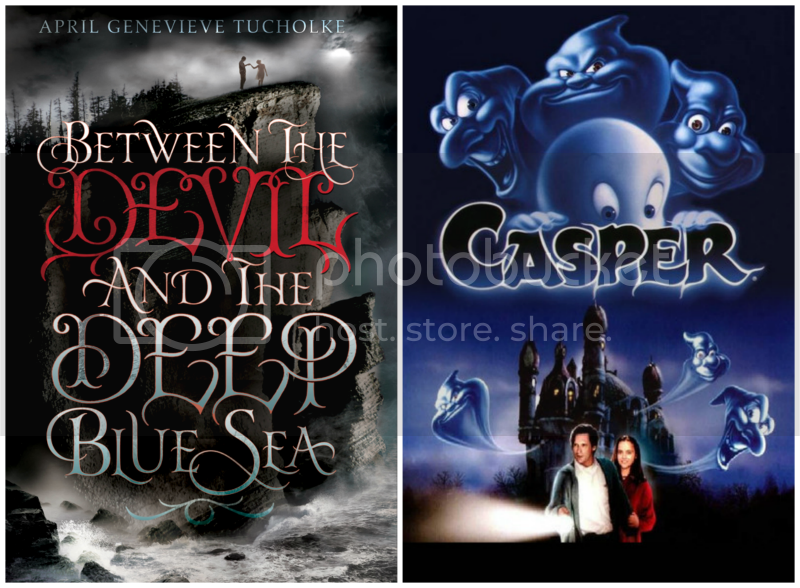 Casper is funny, heartbreaking, spooky, and has a twinge of romance while Between the Devil and the Deep Blue Sea is crisply written, seductive, scary, and gothic to the core. 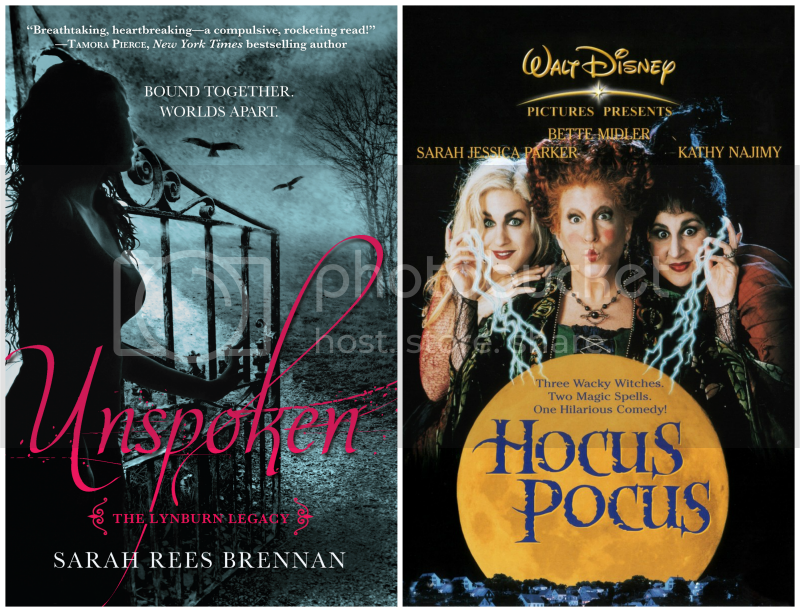 I wrote about both Unspoken and Hocus Pocus last week and it made me realize how well they go together! Small sleepy towns, witches returned after generations, and resourceful snarky teen characters trying to stop them. They also have so much humor mixed with the spooky fall atmosphere. 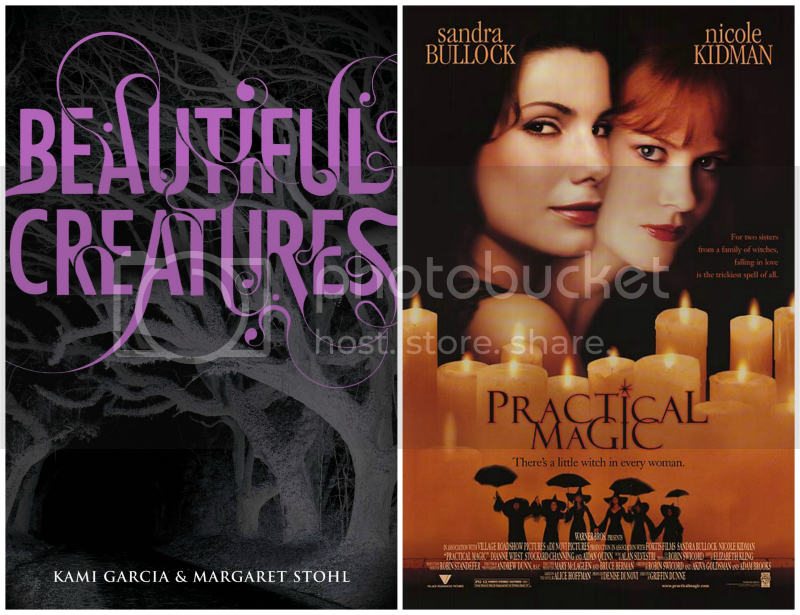 Witches, magic, family curses, doomed romances- that could describe Practical Magic or Beautiful Creatures. They are both supernatural romances tinged with darkness and possession that are ultimately about love. Plus you always need witches around Halloween! 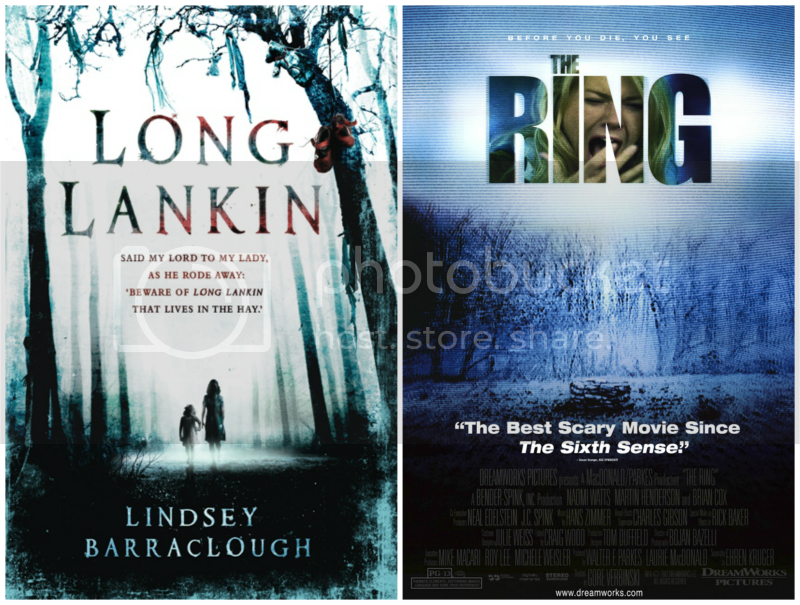 Long Lankin is still the creepiest book I’ve ever read (one that I champion every chance I get) and The Ring has haunted my nightmares since the first time I saw it over ten years ago. Both are so sinister, so unsettling, so undeniably terrifying as the story builds that my skin crawls at the mere thought of them. I loved both but in that way where I don’t think I can ever watch or read either one again. Horror of the first order that frightened me completely and in the case of Long Lankin, left me in awe of the atmospheric writing and characterization, and the vernacular that added a lot to the mid-20th century English setting. I can’t think of either villain without a chill of revulsion and terror and dread in the pit of my stomach. The storytelling is less action and more slow building tension but by the time the climax arrives your eyes will be wide in enthralled fear. Excellently creepy. The Mark of Cain is the sequel to Long Lankin; without spoilers, it has some of the same characters and setting, but focuses more on witchcraft including the creation and use of poppets. A poppet is a doll made to represent a specific person and was used to cast evil spells on the that person. It is as atmospherically sinister and creepy as Long Lankin, even more so in parts- the creeping sort of chill that someone is watching over your shoulder in the shadows, waiting to steal a strand of hair to make a doll of your likeness and stick pins in it. Coraline is a dark fantasy 3D film filled with other worlds, ghost children, button eyes, mouths sewn shut, and creepy witch dolls. It is unsettling and chilling, even though it’s an animated movie for children. The creep factor is high! 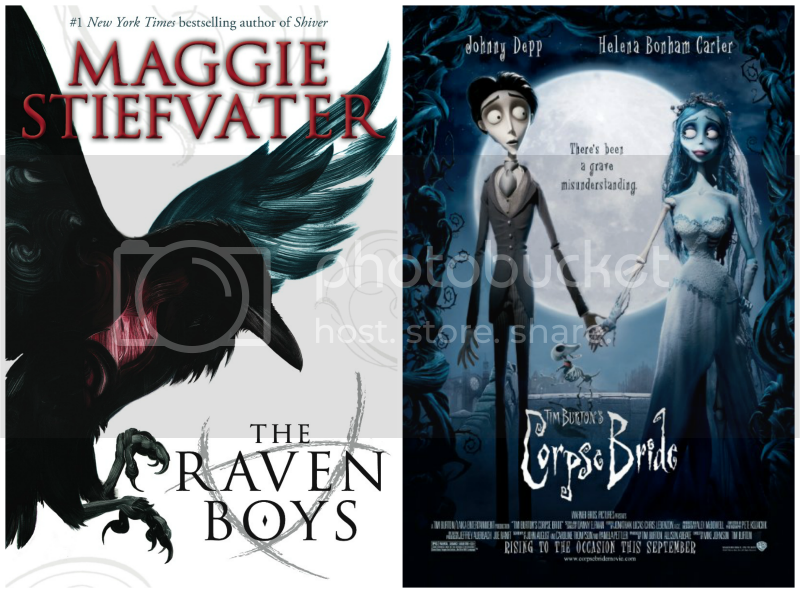 This might be the most tenuous connection but something about The Raven Boys and Corpse Bride makes me feel like they are a good fit. The Raven Boys is a slow, strange, simmering tale of friendship, true love, and supernatural occurrences, including ghosts, sleeping Welsh kings, and tightly twisting strands of fate in small town Virginia. Corpse Bride is an animated stop-motion film about a 19th century British man whisked away to the Land of the Dead when he accidentally marries a girl called the Corpse Bride, although Victor soon discovers that nothing in this world or the next can keep him from his true love. It’s dark and humorous like only Tim Burton can be, with a cast of colorful characters and a spooky tragic atmosphere. There are many modern versions of Sleepy Hollow, including the Disney cartoon and the Johnny Depp movie but my favorite is the show loosely based on the Washington Irving story. 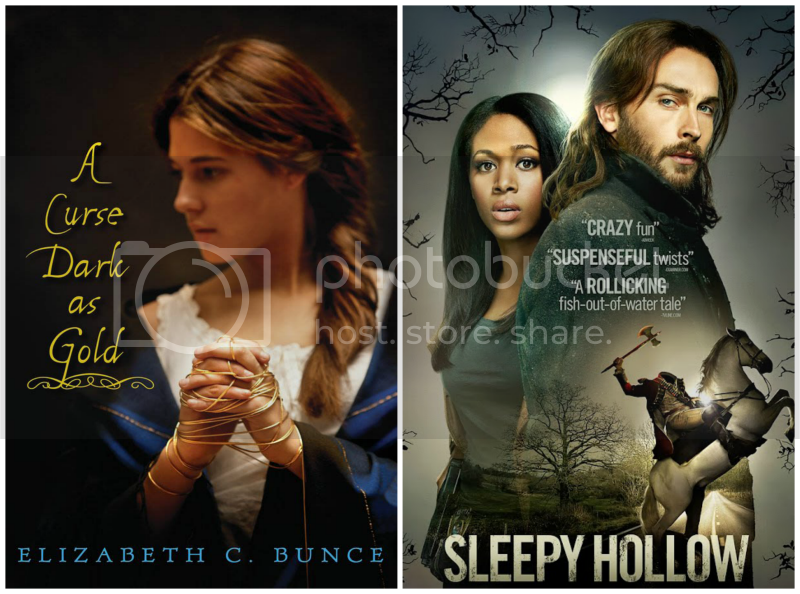 The present mixes with the past, and monsters, witches, demons and all sorts of supernatural creatures haunt the small modern day town of Sleepy Hollow, like they did hundreds of years before. There are creepy woods, witch curses, and a pervasive gothic atmosphere, which are the main reasons I think it would pair well with A Curse Dark As Gold- a magical, haunting, suspenseful historical fairy tale. At its core the book is a Rumplestiltskin retelling but it is also about strong, resourceful Charlotte and the tragic curse that hangs over her family’s haunted mill in small town England. 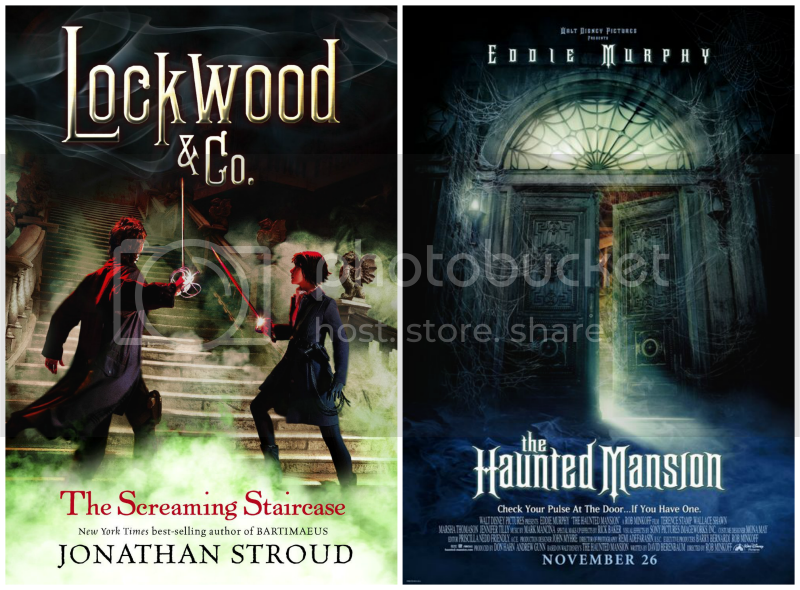 I started The Screaming Staircase recently and really love the comedic tone juxtaposed with frightening ghost encounters so far, which is what The Haunted Mansion is all about. It is based on the Disney ride and follows a family that gets drawn into the supernatural mystery hanging over the crumbling mansion. I laughed and jumped in equal measure- misty graveyards and ghostly curses are always perfect for the month of October. 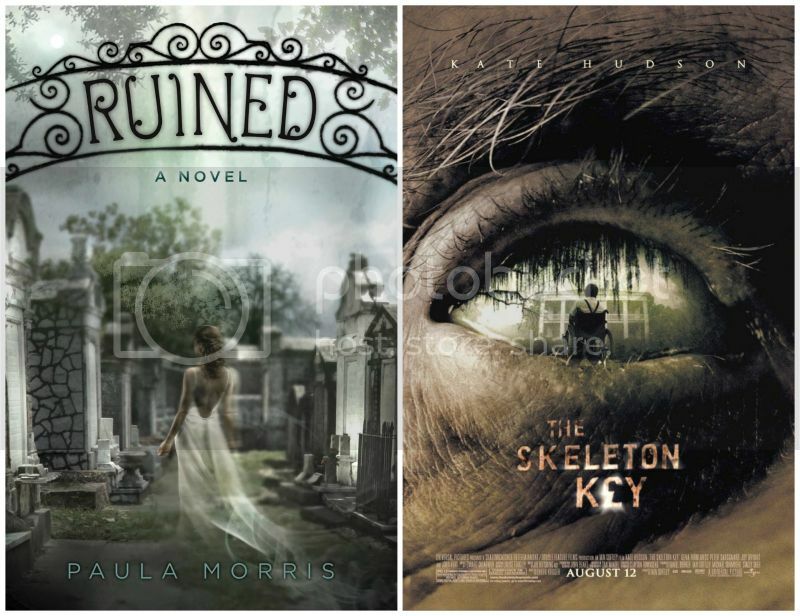 I haven’t read Ruined yet but it’s been on my list for awhile and I can tell how well it would pair with The Skeleton Key, one of the most spine tingling movies I’ve ever seen. Ruined is set in New Orleans about a girl named Rebecca who lives in a creepy house with her aunt and befriends a ghost named Lisette. The Skeleton Key is about a young hospice nurse from New Orleans who takes a job at an isolated bayou plantation and becomes entangled in an evil supernatural mystery. It has a disturbing ending that I think about to this day. A few bonus movies/books in the Halloween spirit that I love but couldn’t quite find great matches for: Paranorman, Monster House, It’s The Great Pumpkin Charlie Brown, The Nightmare Before Christmas, The Glass Casket by McCormick Templeman, A Discovery of Witches by Deborah Harkness, The Distant Hours by Kate Morton. And one bonus book that might be the most perfect fall read ever: Harry Potter and the Sorcerer’s Stone! There’s a great Halloween scene but mostly it’s the feeling of starting the journey to Hogwarts and being whisked away to a world of magic. Nice post. Being in Australia, we don’t celebrate Halloween, but I think the event is getting bigger each year. I absolutely love how you’ve set out your list this week. Very creative. I’m glad you matched Unspoken with Hocus Pocus. 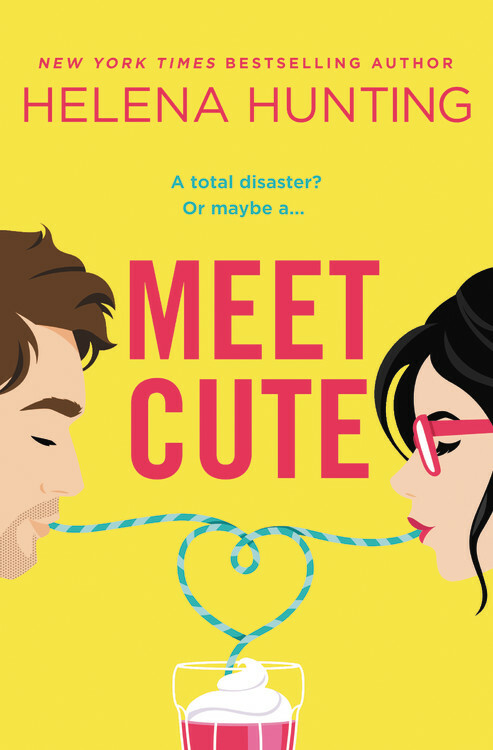 I love that movie and I’m reading the book soon! I forgot about The Haunted Mansion! That movie used to scare me so bad when I was little. Also, I don’t think I’ll ever stop watching Hocus Pocus! I love your blog! 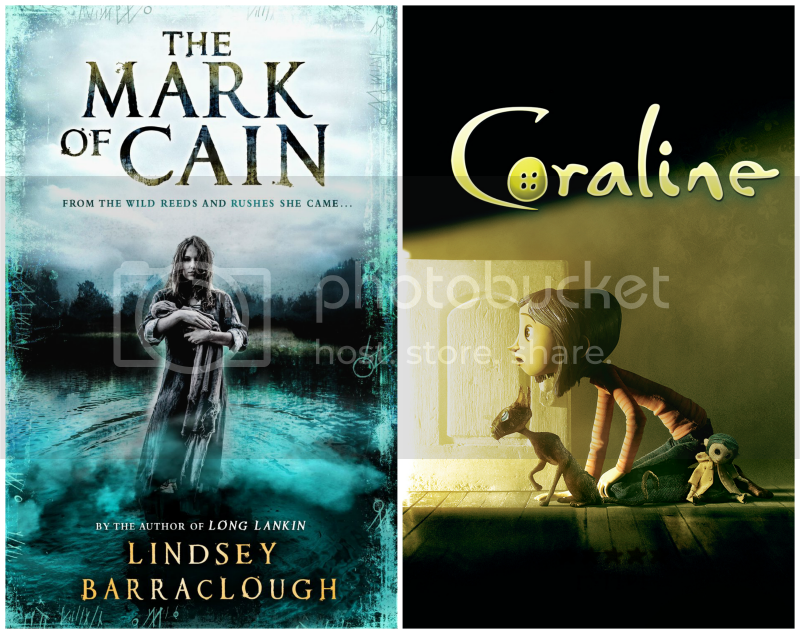 “Unspoken” and “A Curse as Dark as Gold” are on my To-Read list, while “Coraline” is on my To-Watch list, because I really liked the book. Have you read it? Oh my gosh, The Others is such a creepy movie!!! Talk about scary. I love Hocus Pocus. Great picks, for sure! I LOVED The Skeleton Key, I feel like it doesn’t get enough love! OOoh nice! I actually haven’t read any of these, but I did see The Others! Totally freaky and didn’t really see that twist coming when I first saw it! Not much of a scary movie fan so I avoid ones like The Ring! That scared me from previews alone! LOL! I have seen Casper–love!, Haunted Mansion–eh, and watch Sleepy Hollow which I’m very behind on. Think I’m up to 3 episodes now on DVR! Eep! I love the pairing of books and movies. You did a great job! Now my job is to figure out which to watch and read! Hocus Pocus is one of my favorites :) And I absolutely love Unspoken, Kami is hilarious! Awesome pairing! I love how you picked your pairs. That was an excellent way to handle this weeks TT.